Known to most as “Halloween: Samhain is the time that the veil between the world of the living and the world of the dead is the thinnest. In ancient times it was believed that this is the time that our ancestors would return to visit us, to give help and advice. People set out lights in hollowed-out turnips to guide the spirits of the dead (the fore-runners of the modern Jack-o-lanterns) and put out food as an offering (which evolved to the modern tradition of “trick-or-treating”). Pagans are not afraid of the spirits of the dead. They are our friends and family. They are our ancestors who gave us life. We call them our “beloved dead”. Death is a natural part of life, in fact, a gift of the Goddess. If nobody died, there would be no room for new things to be born, not change or growth. Nobody really knows what happens when they die. Most Pagans believe that our spirits live on in one way or another while our bodies return to the elements and sustain other lives. There are many beautiful names for the place where our spirits go: Summerland (the place that is always summer and never winter), Tir n’a Nob (The Irish “Land of the Youth” where spirits grow younger and younger until they are young enough to be reborn) , Avalon (the Isle of Apples, where the dead wander in the orchards of the Goddess, where the trees bear fruit and flowers at the same time), and Heaven (where streets are paved with gold, and the spirits are transformed into angles and spend eternity in the presence of God). However we imagine this place, it is a place of peace and rest where we stay for a time until we are ready to be reborn again, perhaps as an animal or a tree or as another person. In each life we learn new lessons, so our spirits are always growing wiser. Samhain is also our New Year’s Day. It may seem strange to have a new year begin in the fall, when the days are growing shorter and colder. But death and birth are two sides of the same coin. It is the time of death and the time of new beginnings, when we think about hope and change and what the next year will bring. The aspect of the Goddess at Samhain is the Crone. The Crone is the Old one, who teaches us wisdom and helps us let go when we need to change and grow. Growing older means losing something as well as gaining something. The Crone teaches us that letting go is a natural part of life. When we let go, we make space for something new, just as when a person dies, they make room for another person to be born. When we let go of the old year, let it die, we make room for the new year to be born. The time between Samhain and Winter Solstice (Yule) is the waiting time, like when a babe is in the womb, not yet ready to be born. We don’t yet know what the new year will bring, but we can dream, and imagine, and plan! We can feel close to the Crone at this time of year by spending some time with an older person. Visit your grandparents, or an elderly neighbor, who can tell you stories about their life. Knit or Crochet blankets to donate to a retirement home at Yule. The aspect of the God at Samhain is the Horned God, the stag whose antler are fully developed. In ancient times, people depended on hunting for their food. The Horned God was the God of the hunt, and he represents the animal that gives its life so we can be fed. Today, most of us buy our meat at the store, and some of us are vegetarians. But even the vegetables and grains were once alive. The Horned God reminds us that our lives are gifts given to us by other living beings. Because all food is a gift of a life, it is sacred. We treat food with respect. We feel close to the Horned God by stopping for a moment before eating, to thank the plants and animals that have given their lives to be our food. We also say thanks for the work of all those who grew and harvested that food. In our family, we take the opportunity of the Thanksgiving holiday (which does fall during the Samhain season!) to honor the Horned God, to give thanks for the “harvest” of the past year. The Altar at Samhain can be covered with a black or orange cloth. Upon it, pictures of our beloved dead and things that remind us of them are very appropriate. Symbols of the season, such as pumpkins, pomegranates, gourds, Indian corn and fallen leaves make wonderful and beautiful decorations. Orange and Black are the most commonly thought of colors associated with Samhain. But, also consider the other colors of autumn: Rust, Bronze, Red and Yellow of the leaves, the Brown of the Earth, and the grey-green of dying moss. Gum mastic, Copal and Myrrh creates an Other-worldly atmosphere when burnt. Heather and Clove also add to the ambiance. Herbs for this Sabbat should include wormwood and Mugwort. Wash your scrying mirror or crystal ball with and infusion of these herbs. A tea of Chamomile and Valerian can produce a drowsy, trance-like state. Rosemary is used for remembrance, so is perfect for Samhain. Your bonfire, whether it be outside or in your fireplace, should be of Hazel, Hemlock and/or Apple wood. Inscribe runes of divination on the pieces of wood before placing them in the fire, then watch the flames for symbols and omens. Most Pagans consider contacting the dead a risky proposal, at best, we do so only when absolutely necessary. Contacting the dead can be disruptive to your psyche. While some spirits involve themselves in our world as guides and mentors, others remain connected in more negative ways. Spirits need to be free to move on and we can best help them by leaving them alone. Death is a transition, signaling movement from one realm to another, and it’s risky, and rude, to disturb them. Samhain is one of the few exceptions to this rule, but even at this time, we do not hold seances or call up spirits who do not want to be disturbed. During this time we invite those whom we wish to remember to be part of our celebrations IF they choose to join us, but we never coerce. 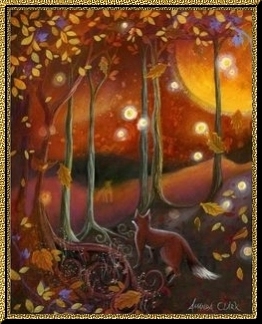 The three days surrounding Samhain are the most potent times of the year for divination and scrying. Since the veil between worlds is thinnest, we can see easily into the realms of spirit and faerie.